Fashion week in Paris is where the hottest looks are born and the not-so-cool are put to rest. 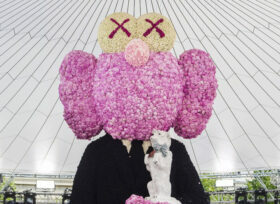 It’s also where you meet your new best friend forever: an impeccably dressed statue made of thousands of peonies. Très chic! During fashion week BFF is quite literally hard to overlook. The 10 metres tall cartoony figure towers over runway models and guests alike and quickly rises to fame on social media. Let’s be honest, who wouldn’t want a selfie with this fashion icon? It took a team of 100 craftsmen four days to construct BFF out of 70.000 flowers. Red roses for his suit and eyes, bright pink Dinner Plate peonies for his hands, feet and head. The latter, naturally, all supplied by My Peony Society. And as it turns out, haute couture heritage mixes well with artistic edginess: while BFF is undeniably odd, he’s also… perfectly awesome! It’s easy to see why Brian went for Dinner Plate, a peony that’s sure to make a lasting impression due to its size and colour. It’s a runway natural! The outer petals are a deep lilac and have a fresh, satiny glow. In bloom, it will turn a slightly lighter hue. Dinner Plate is only available in late season, but definitely worth the wait. Our peonies shine at the launch of Dior's new perfume.